The era of the Merovingian kings of France was brutal and barbaric, and these kings were especially noted for their savagery and cruelty. But it was also a period of high sanctity, some saints martyred and others converting or converted St. Sigismund was the king of Burgundy, whose father had been an Arian, and he was converted to the Catholic faith by St. Avitus, bishop of Vienne. But at heart he remained a barbarian, subject to violent, uncontrollable rages, like many kings of the period. He succeeded to the throne in 516 and, in 522, in one of his fits of rage, ordered his own son to be strangled. The shock of this barbaric act brought him to his senses and in reparation he founded the monastery of St. Maurice in present-day Switzerland, bringing monks from Lerins, Gigny, Ile-Barbe, and St. Claude. He arranged that the perpetual chanting of the canonical hours should take place there and endowed the monastery liberally. He also asked that God punish him in this life for his barbaric behavior; soon after, the kings of France declared war upon him to avenge the death of their grandfather, Chilperic, who had been put to death by Sigismund's father. Sigismund was defeated in battle, escaped, and fled to Agaunum, where he began to live as a hermit near the monastery of St. Maurice, which he had founded. He was later captured by King Clodomir and, even though Bishop Avitus begged for Sigismund's life to be spared, he was killed by being drowned in a well. 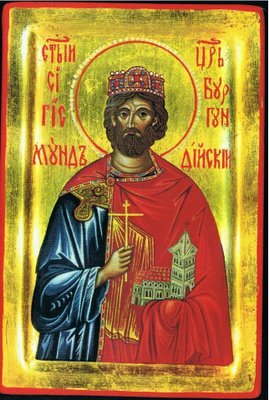 The dead king was revered as a martyr from the day of his death and his relics were taken to St. Maurice. In 1354, part of his relics were brought to the cathedral in Prague, Czechoslovakia, and others were transported to Freising in Germany.